MANAGUA, Jun 13 2013 (IPS) - A five-century wait could come to an end when the Nicaraguan government grants a concession this year to a Chinese company to build a canal between the Pacific and Atlantic oceans, despite local protests and international scepticism. On Thursday, the single-chamber legislature gave fast-track approval to a controversial law that paves the way for the start next year of construction of a rival to the Panama Canal. The 100-year concession will go to the Hong Kong-based Chinese company HK Nicaragua Canal Development Investment Co. Ltd. (HKND Group). The company was selected by the government of leftwing President Daniel Ortega to build the massive canal at an estimated cost of over 40 billion dollars. But many voices in Nicaragua have called for greater transparency in the bidding process for the construction project that will bring to life a dream that has been cherished in this Central American country since the Spanish conquistadors first arrived. One of the main criticisms is that the state of Nicaragua would grant complete rights over the canal for 50 years, with an option for another 50 years, to a company that was set up in October 2012 and established a holding company in the Cayman Islands that same year. The Chinese company’s director, Wang Jing, is chairman of the Beijing-based Xinwei Telecom Enterprise Group, which was awarded a 300 million dollar telecommunications contract in Nicaragua in 2012. But Xinwei is at least four months behind in the investment pledged under the contract. 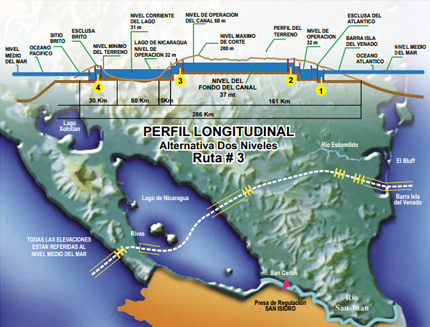 Construction of the canal is slated to begin in May 2014, and is expected to take 10 years. The feasibility studies are not yet ready, but according to the Sandinista National Liberation Front (FSLN) government, a London-based firm has been commissioned to carry them out. The first legal step was taken in July 2012, when at Ortega’s initiative parliament passed the “law for the construction of the interoceanic canal” by a mixed public-private company. The state would hold a 51 percent stake, and the remaining 49 percent would be in the hands of investors, which could be countries, international bodies, individuals or companies. HKND plans to build the canal across 190 km of land, while 80 km of the route would go across Cocibolca lake. The canal will be 150 metres wide and will serve larger ships than the Panama Canal. The project has the firm support of the Ortega administration, which sent the bill – the “special law for the development of Nicaraguan infrastructure and transportation involving the canal, free trade zones and associated infrastructure” – to the legislature on Jun. 5 for fast-track treatment. The bill approved Thursday modifies the original “law for the construction of the interoceanic canal”, modifies the projected route, and grants the concession exclusively to the Chinese investors. It also establishes that Nicaragua gives up any claim to or sovereignty over the concession for up to 100 years. The text was approved by 61 votes in favour, 25 against, and one abstention, after a heated three-hour debate. But the opposition lawmakers withdrew immediately during the separate votes for each one of the law’s 25 articles, to protest what they considered insufficient debate on the bill. The construction project approved by the new law includes the canal, two deep-water ports, an international airport, a “dry canal” freight railroad, a series of free-trade zones, and an oil pipeline. Initial estimates indicate that the canal will have the capacity to handle 450 to 500 million metric tonnes of freight a year and ships of up to 250,000 tons that are 400 metres long, 59 metres wide, and with a berth-side depth of 22 metres. By comparison, the Panama Canal can currently handle vessels 260 metres long, 32 metres wide, with a beam of 19 metres – a size known as Panamax. But the expansion project now underway will double the capacity of the Panama Canal by 2015. The new law grants 100 percent of the shares to the Chinese investors and establishes that the transfer to Nicaragua will be gradual, starting 10 years after the canal begins to operate. Nicaragua will receive 10 million dollars a year until all of the shares have been handed over a century later. The business chamber and investors in Nicaragua support the government’s plan, albeit with some reservations. But it is staunchly opposed by the rightwing opposition and Sandinista dissidents, as well as environmentalists. Eduardo Montealegre, head of the opposition legislators, told IPS that Ortega and his officials were “selling out the country” with the broad concessions granted to foreign investors that, he said, hurt Nicaragua’s current and future interests. Constitutional lawyer Gabriel Álvarez told IPS that the concession of the project to Chinese investors violated the constitutional article on national sovereignty, and left the country vulnerable to local or international legal action. Biologist Salvador Montenegro, director of the Research Centre for Aquatic Resources of the National Autonomous University of Nicaragua, told IPS that any construction project involving Cocibolca lake endangered biodiversity, and Central American society as a whole. The 8,624-km long lake in southwest Nicaragua is the region’s largest freshwater reserve. The government’s secretary of public policies, Paul Oquist, dismissed the demands by environmentalists and politicians and anticipated that after construction of the canal started, GDP would grow 10.8 percent in 2014 and 15 percent in 2015, compared to the current four to five percent. The government projects that GDP will climb from 10 billion dollars today to 24.7 billion dollars in 2018. But without the construction of the canal, GDP would stand at 14.9 billion dollars in 2018. Ortega informally discussed the idea of the canal with U.S. President Barack Obama at the May 4 summit of presidents of the Central American Integration System in Costa Rica. The initiative has not drawn official reactions, either positive or negative, from Nicaragua’s Central American neighbours. Only Panamanian President Ricardo Martinelli congratulated Nicaragua for the plan and offered it technical assistance. HK Nicaragua Canal Development Investment Co. Ltd.